Domestic terrorism threat from returning jihadis: Research on fighters in Syria and Iraq. They may be in Syria, but they’re still on Facebook and Twitter. 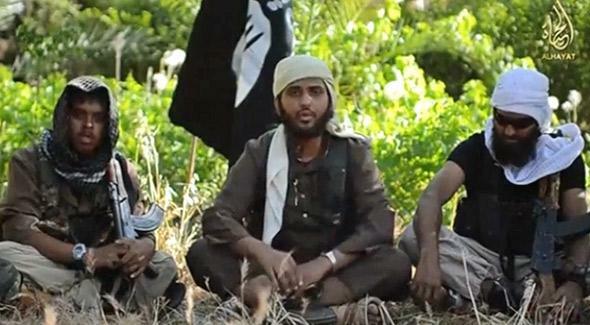 British-born Nasser Muthana, center, in a recruitment video for ISIS. A week after taking Iraq’s second largest city, Mosul, the insurgent group the Islamic State of Iraq and Syria published a slick 12-minute video. Its protagonists were a group of British and Australian Muslims sitting in front of a black flag while talking about the virtues of jihad and martyrdom, and urging their “brothers back home” to join them. According to U.K. Prime Minister David Cameron, these young men are the next generation of terrorists who might attack shopping centers and blow up London buses after returning. They are, in his words, “the most serious threat to Britain’s security that there is today.” But how significant is the risk? And what should be done about it? The idea of volunteers fighting in foreign conflicts isn’t new. Based on numbers alone, Cameron is right about the scale of the threat. The Syrian conflict has mobilized more foreign fighters than any since Afghanistan in the 1980s—possibly even longer. Up to 20,000 young Muslims—including a young Saudi named Osama Bin Laden—went to Afghanistan over the course of a decade, compared with an estimated 12,000 who have gone to Syria in the past three years. A quarter of the foreign fighters in Syria are Western, and although Britain is not the biggest contributor (Belgium and Scandinavian countries are), it accounts for around 500 over the three years. These numbers are the result of research by me and colleagues at the International Centre for the Study of Radicalisation over the past 18 months. In addition to fieldwork in Turkish border towns, from where the vast majority of foreign fighters enter Syria, we have compiled the social media profiles of nearly 400 Western fighters in Syria and Iraq using the software platform Palantir. Despite being involved in a war, they are still updating Facebook and Twitter, and this has enabled us to interview—and stay in touch with—dozens of them. From these conversations, we know that the vast majority of British foreign fighters—maybe 80 percent—have joined ISIS, the most fanatical of the Syrian rebel groups, which has declared an Islamic state and taken over large parts of northwestern Iraq. But we also know that they are too busy fighting hostile rebel groups as well as the troops of Syrian President Bashar al-Assad and those of the Iraqi government to be seriously thinking about blowing up buses in London. It also points out, however, that the 1 in 9 who become terrorists are likely to be more effective, competent, and influential than “home-grown” extremists who haven’t had the same opportunities to acquire military training, bomb-making skills, and fighting experience. According to the study’s author, Norwegian political scientist Thomas Hegghammer, terrorist plots with foreign fighter involvement are nearly twice as deadly as those without. There can be no doubt, therefore, that jihadi foreign fighters—in Syria, Iraq, and elsewhere—pose a risk that the government and its security agencies are right to focus on. Yet it is one that I believe can be managed and mitigated. It makes no sense, in my view, to hand out long prison sentences to every returnee when the evidence suggests that a majority will pose no risk—yet that’s what the U.K. government is proposing. If just 1 in 9 will become terrorists at home, the government’s priority should be to develop assessment tools, rooted in the psychology of terrorism and suicide attacks, that help to distinguish between people who are “dangerous,” “disturbed,” “disillusioned,” and “harmless,” and develop appropriate interventions for each. Conveniently, these tools already exist. They are part of the government’s so-called Channel program, which directs when interventions are necessary for individuals deemed to be on the brink of violence. Recalibrating this program to deal with foreign fighters is likely to be more effective—and certainly less expensive—than locking up hundreds of returnees for 20 years or more. Remember that detention without attempts to combat extremist ideology can result in hardened attitudes and a return to jihadi conflicts—for example in the United States after the Afghan conflict. Much more effort also needs to go into messaging. We could deter participation in jihadi conflicts by telling would-be foreign fighters that Syrians don’t want them there, and that ISIS will use them as cannon fodder; only one British foreign fighter in Syria has been killed fighting Assad, while 15 or so have lost their lives fighting other rebels. If foreign fighters really are “the most serious threat that there is today,” the government needs to bring together community leaders and make sure that those messages are heard by every young Muslim across the country. Punitive measures have their place, of course. But they should be reserved for those who have become hardened jihadis determined to take the fight home. Success in recognizing who poses a threat and who doesn’t will determine how much of a threat the foreign fighters actually are.